Knives are an integral part of any kitchen, but how many of us actually have a good set of Chef’s knives? I’ve been using a motley collection to chop, cut and slice most of my life and living in a Cornish cottage, I never expected to see a contemporary and stylish knife set, such as this one from Edge of Belgravia, sitting on my kitchen counter top. Launched in 2010, Edge of Belgravia prides itself on the quality and avant-garde design of its products. Innovation and practicality are key to its success, as are its use of high-tech materials. Now globally acclaimed in the field of daring knife design, their products became available in the US in 2013. The Precision knife set, launched in 2013, is the most affordable in the range. The stainless steel blades are sharp, the surfaces have a Swiss llag non-stick coating and the handles are comfortable to hold. The knives are smart to look at too; Christian Bird has designed the handles to resemble the facets of a diamond. The set consists of four knives and retails at £69.90. The knives can, however, be purchased individually. One or all of them would make great Christmas presents. The Black Diamond knife block, also designed by Christian Bird, is both elegant and functional. It’s not only devised to hold pretty much any kitchen knife as well as the Edge of Belgravia collections, but it’s also a piece of art in its own right. Futuristic in design, it’s fashioned to reflect a rough cut diamond and pairs perfectly with the Precision knife set. The block has space for eleven knives and most will slide in and out of it with ease. It uses a clever weighting technique to ensure the knifes stay put. It’s currently on offer at a reduced rate of £89.90, normally £99.90. Edge of Belgravia is kindly offering one Tin and Thyme reader an exclusive Precision Knife Set & Diamond Knife Block, RRP £169. To be in with a chance of winning, please fill in the Gleam widget below. You will need to leave a comment on this post, answering the question, which then gives you additional chances to enter if you so wish. Gleam will pick a winner at random from the entries received. If you are commenting anonymously, please give me some way of identifying you as I will be verifying the validity of entries. Any automated entries will be disqualified. This giveaway is only open to those with a UK postal address. Winners will need to respond within 5 days of being contacted. Failure to do this may result in another winner being picked. Prizes are offered and provided by Edge of Belgravia and Tin and Thyme accepts no responsibility for the acts or defaults of said third party. Tin and Thyme reserves the right to cancel or amend the giveaway and these terms and conditions without notice. Thanks to Edge of Belgravia for the knife set and block. There was no requirement to write a positive review and as always all opinions are my own. Look like good knives – I especially like the block something a bit different, very stylish. I would make a fish salad, bass, potatoes, salad and a lemon dressing! Lovely set would love to see how good these really are. These knives look amazing. Functional, but also bringing style to the kitchen. It would be Great to Own a Matching Set of Knifes , instead of The Motely Crew I have at Present. I suspect I wouldn’t be allowed to use these, too sharp and too nice for me! That would be her excuse anyway, we do have nice sharp knives. I think Lisa would try them out on lots of lovely root veg for a soup. Celeriac and swede are a good test. A turkey curry on boxing day! I would chops leeks and potatoes to make a lovely leek and potato soup. As one of my daughters is a vegetarian and the other has recently started to eat fish since going to university, I would buy a whole salmon in the sales and learn how to fillet it correctly as earlier in the week when I purchased a reduced salmon, the knives I used were old and blunt as I’ve had them since I got married 26 years ago, therefore the salmon fillets were rough, hacked and didn’t look very appetising. I’ve also been looking at Santoku knives, however they’ve all been very expensive, and this set would give me the opportunity to experiment more and encourage the girls to continue with their new tastes in food. I usual have a sandwich for my lunch so I would most like slice some tomatoes first as I love them and have them in nearly all my sandwiches! I would use it to cut up veg like potatoes, carrots, parsnips and onions to make a vegetable stew with vegetarian sausages and dumplings. I’d make Asian Vegetable Stew because there is so much chopping involved and with this set I’d have it done in no time at all. This knife set is practically art! This is a fantastic looking knife set wow!!!! I would probably end up cutting] my fingers first. don’t let me win!! Haha, I managed to nick myself on one yesterday John! We would chop up veggies, probably to go into a roasted mixed veg tray. Peppers, onions, garlic, some cherry tomatoes, and any other veg we happen to have hanging around. Always comes out delicious. First i would use the bread knife to cut my home made bread for a festive Turkey & cranberry sandwhich. I would chop lots and lots of onions and freeze them. Chopping onions puts me off trying so many recipes, thanks. I would chop onions to go in a chicken stir fry. I would chop up lots of winter vegetables and prepare some wonderful warming soup for all the family! we like to dice potatoes and onions to fry with bits from the fridge leftovers. It would yet another of my vegetable and bean soups, it’s a staple in the cold months and we all love it. On some fruit to make into a fruit salad as my kids love that! I would try to cut up a butternut squash. I really need a knife that can cut one of those ! Onions – I use a lot!! I use to make braised eggs and smoked aubergine with sumac and preserved lemons. I would be using it to chop veggies and make a delicious minestrone with lots of beans! I’d make chicken fajitas. So would cut the peppers, then the chicken . Great prize. Thanks for the chance. That is a really stylish knife block, would love to win it! I think I would make a sweet potato gratin – the sharp knives would be great for slicing the potato really thinly – then, add cream, garlic and chilli – wonderful for a winter evening! I would slice some Bread first and then decide on a meaty dinner so that I could use the Chef’s knife second. I would chop up some chicken breast for tasty wraps. Tomatoes , every time i make a salad my knife just squishes them ! Oh yes Chris, mmmmm, indeed. Squash is one of my all time favourites, but it’s such a pain to prepare. cheese on toast – our staple diet!! I’d probably cut onions/carrots first with it – as those tend to get consumed the most in our house. It would probably be for a casserole to heat us up in this cold weather. We love all kinds of things with our sandwiches so I feel sure that celery and cucumber would be among the first things that I chop – on a daily basis. Pineapples- love fresh ones but always struggle to prepare them. I would use in a fruit salad. Cutting up apples to make my chicken and apple salad. I would dice onions and chop tomatoes in preparation for making a tomato sauce. I would make stew and dumplings. 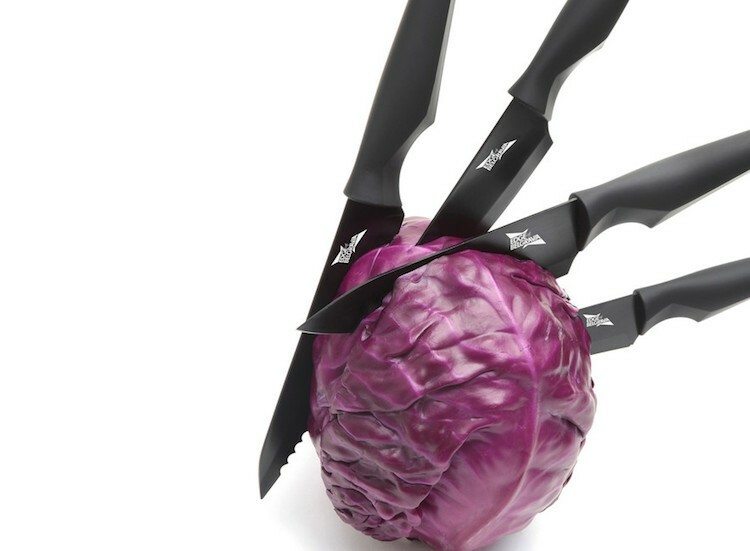 I thin I would make a Christmas coleslaw, chopping all the veg by hand with these lovely sharp knives. Would make a change to have knives sharp enought tbh! My favourite thing currently are marinated halloumi and pepper skewers. So these would be great for that. It would be a leg of lamb which Has always been difficult. I would make a vegetable soup. My knife skills leave a lot to be desired, so these could perhaps help me practice. I love making my own coleslaw, we eat many variations of it with different meals, so I’d probably use them for that first. I’d use it on vegetables to make Vegetable Risotto. Wonder if these wonderful knives would enable me to cut my bread straight, because I’d be making a sandwich first. Cutting up fruit for a lovely healthy fruit salad! I would make a vegetarian stir fry yum! I would use the bread knife on a freshly baked crunchy loaf from the bakers to make a yummy chicken salad sandwich. My favourite! As a big lover of vegetables, and at the moment particularly cabbage, it would most likely be some nice crunchy cabbage and some mushrooms, fried up with some garlic 🙂 yum yum! Cabbage is just so good at this time of the year – love it. Ooh, I’m intrigued by a fake mac n cheese. How do you make that? Would love to make a roast dinner for all the family! My knifes are rubbish! I’d put them to work on some butternut squash to make a spicy winter soup. cutting cheese for my son when he comes home. I’d start by chopping chicken and then go on to lots of veggies for a nice stir fry! I would start by trying to effortlessly slice a tomato, something my current knives are too blunt to achieve. I would then use that tomato, and others, in a lasagne. I think I’d use it to make something that needed a lot of chopping like homemade chutney. I’d make us a lovely pasta salad with loads of fresh chooped salad veggies…just to make us feel a little less guilty for over indulging at christmas. Butternut Squash – I love it roasted but it is so hard to cut and peel. I would chop up lots of veg, such as carrots, parsnip, swede and make a chunky beef stew. Winter vegetable stew. Must be good to chop a swede! I would use them to prepare my veg, for a classic Sunday roast. I would chop loads of veg for a soup or a stew. Really struggle with the rubbish knives i’ve got. It would be a swede to go into a sausage casserole. The reason I’d choose a swede first is so I could experience the difference using a Precision knife. I’ve always had trouble cutting swedes! I would chop up some tomatoes and mushrooms and treat myself to a tasty fried breakfast. I would cut lots of vegetables to make a big pot of winter vegetable soup. I’d use them to chop vegetables to make a nice thick winter soup. All of my current knives are rubbish so I think the first thing I would use one for would be to carve a chicken. At the moment, I end up ‘pulling’ the flesh to bits with my kitchen knife. I would also like to use one for cutting a loaf of fresh bread. Cutting homemade crusty bread..nothing better than the smell and taste of home cooking! It would be to chop up a butternut squash for some soup. My current knife really struggles. I’d use one of a suede to make suee and carrott mash. suedes are a bugger to chop up! i would cut a nice fresh loaf of tiger bread yum! I would tackle a butternut squash. I love making homemade soup, but always struggle with chopping up the squash. The first item would be an onion, to go in a yummy coleslaw. It would be a fresh and healthy salad, with lettuse, carrots, cucumber, tomato, peppers al so finely chopped with these amazing knives! I would make a vegetable and chickpea curry. I always have trouble with tomatoes so I’d have to go with a ratatouille, nice test for them with the courgettes too (I only like them when they’re wafer thin). I’d use it on the onions for my yummy stir fry! Bread Knife (6″) – would use this to slice some of the fresh bread our local stores make – amazing bread – just need the right knife to give it justice! vegetable casserole and I’d use the knife for cutting up all the vegetables to go in it. I would make a coleslaw for my husband to dress his salad. For myself, I would make a red cabbage, figs & goats cheese salad. I’d chop vegetables to make a vegetable stir fry. We tend to bulk buy meat, so cutting the meat up to freezable meal portions is the thing, a good set of knives like these would be perfect. Potatoes, cut them nice and thin for dauphinoise! I would use it to chop cabbage and I would make Cabbage & Coriander curry which happens to be my OH’s favourite! I’ve recently gotten into buying larger bits of meat and then chopping them up at home to freeze – a big of an economy drive. So, I would get a whole chicken, portion it up and probably make herby poached chicken with a veg stock. Yum. I would use it for chopping veg for a stir fry. I would use these knives to make a nice, chunky vegetable filled pasta sauce. I’d chop loads of lovely vegetables to make a warming winter stew. I would probably only be “allowed” to cut my morning grapefruit with one, and nothing more complex than that, as A) they look very sharp and I’m very accident prone; and B) my Fiancé has a thing about good knives and would want to do all the chopping using such a “manly” implement! I would make a lovely chicken curry and use them to cut the chicken and vegetables. Slice cheese for my favourite and famous cheese sandwiches! I’d make my mum’s lasagne! It takes 4 hours to make (but is well worth the effort) and involves plenty of chopping – onions, celery and carrots! I would make roasted vegetables – I love the dish, but don’t enjoy chopping all of the veggies up. Onions ! they seem to be in everything I cook at the moment. I would make some homemade vegetable soup and try them out on the vegs. i would use them to chop veg and meat to use in a curry. Would probably be to chop onions, for fajitas (my favourite meal)! I’d chop up some carrots, for some carrot and lentil soup. I would make a homemade curry. The knives would be ideal for cutting all the fresh onions, garlic, ginger etc..! Chop up lots of root veggies for a vegan curry. I’d make a vegetable curry and naan bread, these knives look great. I love homemade lasagne and these would make prepping so much easier. I’d chop and peel some potatoes for a roast. I would probably chop and peel some potatoes for a roast. Roast potatoes are a favourite in this household. I would like to dice up a load of fruit and make a lush fruit salad. Little dribble of fresh double cream and you got yourself a tasty treat!!! I would chop lots of vegetables and make vegetable soup. I would cook Thai Style stir fry with egg fried rice and Papaya Salad! I would chop up lots of fruit for a large fruit salad. Id use them to prep all my veg before blanching and freezing for the month. Waste not want not and all. Great idea. I made a delicious braised red cabbage dish just before Christmas and it lasted ages. Some nice crusty bread to have with soup, hmm delicious! I’d try it with tomatoes because you can always tell your knife is sharp if it can easily cut through the skin. Looks really good – definitely hope I’m in the running to win the set! I’d thinly slice tomatoes, onions, mushrooms and peppers to make a yummy pizza. I would use these great knives to chop up a variety of vegetables to make a vegetarian curry. I am another vegetarian with a sweet tooth and began learning to cook by baking cakes and biscuits. Yum! If I were lucky enough to win the knife block, I would use it for root vegetable casseroles and, if I can find them, anything in the pumpkin family. i would make a really big winter stew, so i could chop and chop and chop…..
I’d test it out on a simple salad. I like to see how sharp a new knife is by using it on a tomato. I would cut up some beef strips from a big juicy steak to stick in a teriyaki stir fry! The first thing I’d make would be a casserole, lots of chopping! potatoes, carrots and onions to prep an irish stew! I would use them to make a fresh and zingy coleslaw salad! I’d chop up a butternut squash for a lasagne. I have broken numerous knives trying to get through one of those! ONIONS – Every recipe needs onions! On vegetables to make crudites dippers for my dips! I love these stylish knives – I prepare lots of meals and freeze them so these would come in handy for all that veg chopping! definitely for chopping up all the veg needed for a nice roast, i can already taste it! I would try out the Paring Knife first, for slicing up a crisp apple, thanks. I would use it to take chicken thigh off the bone in order to make Bourbon Chicken which is one of the most gorgeous meals I’ve every made! I’d use them chopping swede when making a stew. We’d probably use them to make one of our homemade vegetable soups. I’d use the chef’s knife to chop loads of veg for a stew and a soup. There is something very satisfying about chopping veg with a good knife! I would prep my veggies for roasting down and then add some of them to a soya ‘wellington’ and save the rest for making veggie burgers. It would be great to have knives that can cut through butternut squash etc with ease and not end up with uneven sizes that won’t cook at the same rate. I’d use them on my potatoes, carrots, leek, broccoli, parsnips and make a lovely roast dinner! I’d make a potato and leek soup to warm us up in this cold weather! I would prepare a stir fry. The knives would make short work of chopping up all the ingredients, great when you are in a hurry. I’d cut up vegetables for my slimming world chunky vegetable soup! If I win these, I promise not to put them through the dishwasher! I would make something for the slow cooker, so perhaps a beef casserole with lots of veg to bulk it out. I’d use the knife set for slicing up veggies for a lovely veggie curry. Yummy! These would be perfect for my new passion – vegetarian sushi, I need a sharp knife to be able to cut the slices when it has been rolled, I havent quite got the hang of making it yet I end up with rice in my hair and have found it in places I dont care to mention! Haha Bridgette, I understand completely. My attempts at sushi have looked less than perfect. I’D CUT MY POTATOES AND MAKE SOME CREAMY MASH! I’d make a nice stew with beef and lots of yummy vegetables. The knives look perfect for cutting up all the ingredients. I would chop vegetables and steak to make a gorgeous warming winter stew – healthy too. I would chop an onion for my infamous spag bol! An onion! Our current knives are rubbish at cutting onions! I’d probably make a soup with it. Would make a hearty beef stew, with lots of veggies. I would make a nice beef stew. I would chop up cheap cuts of beef with this fabulous set then use it to chop all of my vegetables. Thanks for the chance. Love watercress soup, but never tried it with a poached egg – nice idea. I’d prepare a vegetarian stew with carrots, runner beans, potatoes and soya pieces. Prepare vegetables for a roast. I’d chop carrots, onions, celery and potatoes and make a delicious chunky vegetable soup. I’d probably do a veggie chilli. So I’d be grateful for some good knives to chop up the veg! As part of my healthy eating plan I would make a delicious, nutritious chopped salad. I would slice some tomatoes, very tricky with a blunt knife! Something the Maltese call ‘Minestra’. A mixture of various vegetables chopped and sliced to medium size chunks and stewed for around 20 minutes – much nicer than it sounds, especially if you bung in a tin of baked beans for good measure. cut up fish for a fish pie, I hate that job, and having a sharp knife would make it so much easier and quicker! I always struggle to find good knives at an affordable price. These seem just perfect. I would cut up a fresh swede into perfect dice for a wholesome vegetable stew. I would make a soup with lots of tough to chop veggies! Oh I love guinea pigs. We used to have them years ago, but sadly can’t accommodate them now. We used to let them out to graze on the lawn. The first item I’d use one of them on is a tomato as I’ve only got one knife that’s really good at slicing them. So I guess I’d be having a cheese and tomato sandwich. Then I’d have to test them out on slicing veg and meat for a nice stir fry with rice vermicelli. One of my favourite meals is red cabbage, leek and onion stir fry with salmon. I would use it to chop up all the veg. I’d use it to chop up all my vegetables for my spaghetti bolognese recipe. Should make easy work of it. Would love these, I’m forever replacing my rubbish knives with equally rubbish ones as I cannot seem to find an affordable set that can cut more than a soggy carrot! I’d use a Precision knife to slice some potatoes for a cheese & potato bake. I’d use the bread knife first as we never have enough of them. It would be for my lunchtime sandwich I suppose. I would use them to make my favourite stuffed butternut squash with feta, red onion and pine nuts – we love it, but it normally takes me ages to prepare, due to my rubbish knives! I would use the to slice the vegetables to go into a lovely warming beef casserole. I’d use it on an onion to make a lovely shepherds pie! I’d make our family favourite of a beef teriyaki with mange tout. That way I can use lots of different knives. With my new year health kick I will probably use them on another salad if I win! I would be making a traditional Scotch Broth soup, so I would be using my new knives to slice up all the vegies…making them nice and chunky! Just the way I like it! Amazing! I would use it to cut up all the veg for a huge family sunday roast! I would use a knife on some root vegetables and make myself some vegetable soup. I’d chop an onion and make a risotto… onions are a good test I think! Amazing prize! Perfect for chopping veggie for my clean eating diet. Salad Nicoise – the mix of ingredients will be a real test for new knives. I would make a stirfry, the ultimate test, slice various veggies all uniformly. I’d use it to cut up all my vegetables for my homemade soup. Bad boys- onions first! I would chop cauliflower and extra mature cheddar and make a cauliflower cheese! I would use it to slice all the veg for a good beef stew. Fabulous looking Knife Set to add some style to our kitchen. They would be put to great use chopping up all the vegetables for our delicious stir-fry. I would use the bread knife first to cut my Greek bread thin then use the chef’s knife to cut my tomato extra thin. There is nothing quite like a tomato sandwich! These would make meal prep/batch cooking easy. Useful for all the veg and prepping of meat. If I was lucky enough to win I would really put the knives to the test and start with chopping a couple of sweet potatoes into wedges. Then I would challenge them to a swede – I have never yet met a knife that can tackle a swede with ease! Being a vegetarian it great for the veggies and the new kitchen. The very first thing I would do with these amazing knives (even the knife block is a work of art!) is to prepare one of my family’s favourite evening meals! A delicious Chinese style stir fry with lots of various chopped vegetables! These knives will make short work of the usual laborious task of chopping all the veg with my current virtually blunt knives! I’d make a spaghetti bolognese and us the knife on the various veggies I sneak in there for the kiddies. I need some good knives to dice everything extra small (so they can’t distinguish it) – celery, carrot, mushrooms and courgettes. Good luck Christine. Having the knives out and looking good has to be a good thing. As it’s Winter, I would use the knives to chop up lots of healthy vegetables to make pots of soup to see us through the colder days. I would love to use these knives! I’ve just got into cooking and my current knives are so blunt! I would first cut up some chicken to make chicken stew. I would cut up fillet steak to make Steak Tartare – it must be cut finely, not minced and a super-sharp knife is what is needed for this taxing task. I’d use the knives to make a gorgeous chicken tikka masala – the knives would really help to slice the onions thinly! I would cut some onions and garlic as that’s always the first step of my recipes. The first thing I’d do is dice up some tomatoes and onions for a nice fresh salsa! Sweet potatoes. they are tasty buggers! lots and lots of healthy veggies to help my diet….2ib gone already. What a great prize i would love to win! Would look fab in my kitchen! I love cooking, and I always struggle with the knives I currently own. I would probably do some batch cooking, making up some soups, lasagne, curry sauces etc. Vegetables for the Sunday roast. Would love to make a fancy chicken salad. I have an allotment so have lots of lovely veg. I would use the knife to cut up carrots, potatoes, onions peppers and leeks to make a dish of roasted vegetable. We grow some of our own veg too Patricia. I find though, it’s not so much the chopping, as the scrubbing that takes so much time. Would chop lots of onions for French Onion Soup – and make sure my fingers are well out of the way!! Use it to trim sprouts to make a spicy sprout curry! Ooh yes, slow cookers are just perfect at this time of year. I would chop and onion, and then go on to make a chicken risotto. I would probably chop up some carrots and celery for dips in my packed lunch! I would make beef stew and dumplings. Need a good knife for cutting meat! I’d use it to chop cucumber, ginger and turmeric for my morning smoothie! Now that sounds nice. I often add turmeric but not tried it with cucumber too. With my new healthy life style change started this would be great for chopping all my lovely fruit and vegetables ready for my soups and juices. Chopping, slicing and dicing some lovely veg for a stir-fry would be my first choice. I’d make a stir fry, with a rainbow of vegetables. I would use it to cut onions for my favourite type of food: chicken curry! Soreen malt loaf! damn that squishy tasty snack that my knives won’t cut! I’d tackle celeriac, butternut squash and tomatoes. If they can cut those I’ll be very happy! My husband does all the chopping now though due to my silly joints. Thank you! Hasselback sweet potatoes – sweet potatoes are hard to chop! I really cant stand dull knives in the kitchen when cooking! They’d be great for making a lovely gratin dish with potatoes, onions and maybe some leeks. These would be great for lots of tasty recipes! Tomatoes, tricky beggars – I’d use them in a delicious pizza. To prep multitude of veg for a stir fry!